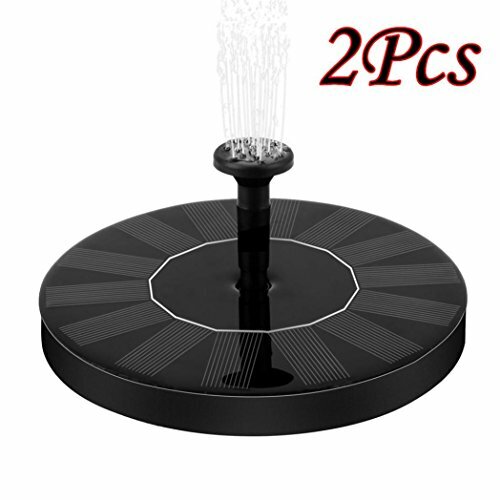 oldeagle 2Pcs Outdoor Solar Power Bird Bath Fountain Water Floating Pond Garden Patio Decoration Environmental-friendly | Fountain City Art Ctr. ❀❀❀Hope you have a nice time on shopping! Solar-Powered direct water pump Kit. Solar water pump is conveniently powered by energy from sunlight, no external batteries or electricity needed. High energy conversion rate and environmental-friendly. Solar fountain pump with 4 Nozzle Spray settings to create a relaxing environment. Solar water fountain is suitable for garden decoration, for bird bath, fish tank, small pond, water circulation for oxygen, and much more. Solar pump is added a new bottom cover to effectively prevent clogged nozzle. The solar powerd bird fountain kit will stop working when dirty or blocked. With regular cleaning no worries, no stress. The solar fountain for birdbath has more than 10,000 Hours of service life. The solar water fountain pump has a built-in brushless motor that provides a longer service life and lower energy consumption. ❀ If you any problem about our items, Please send message to us, we will try to our best to help you. ❀ Before you leave a negative feedback, please send an email to us. We are sure to help you resolve the issue and offer you a satisfied solution. ❤ Solar-Powered direct water pump Kit. Solar water pump is conveniently powered by energy from sunlight, no external batteries or electricity needed. High energy conversion rate and environmental-friendly. ❤ Solar fountain pump with 4 Nozzle Spray settings to create a relaxing environment. Solar water fountain is suitable for garden decoration, for bird bath, fish tank, small pond, water circulation for oxygen, and much more. ❤ Solar pump is added a new bottom cover to effectively prevent clogged nozzle. The solar powerd bird fountain kit will stop working when dirty or blocked. With regular cleaning no worries, no stress. If you have any questions about this product by oldeagle, contact us by completing and submitting the form below. If you are looking for a specif part number, please include it with your message.